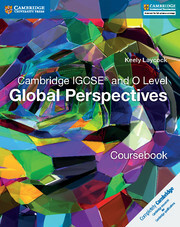 Skills-focused resources to support the study of Cambridge IGCSE® and O Level Global Perspectives, for first examination in 2018. The Teacher's Resource CD-ROM offers further teaching ideas and support, drawn directly from the author’s experience of examining and teacher training for Global Perspectives throughout the world. For each chapter, the resource contains: Scheme of Work, sample lesson plans, suggested answers to activities in the coursebook, further teaching ideas and worksheets. 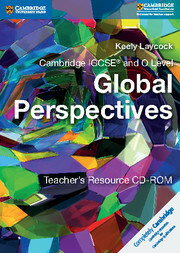 Written by a Global Perspectives specialist, with years of examining and teacher training experience in the subject. Suggested answers to activities in the coursebook to help save time spent on preparation. Sample Scheme of Work and lesson plans to support you during the planning process. Worksheets to be used in class, saving you time and encouraging an exploratory and active approach to learning. Further guidance on assessment and teaching ideas.